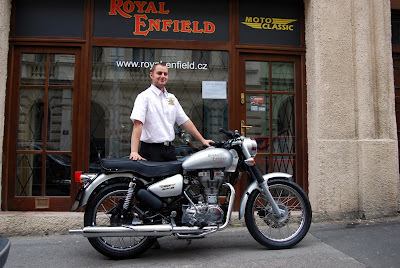 New Royal Enfield dealership in Prague. 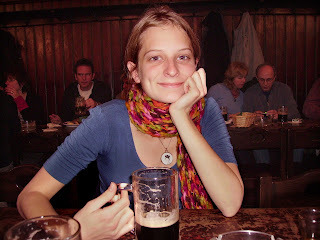 Writing from Europe, my daughters told me that Prague is "awesome." I found out how right they were when I visited the capital of the Czech Republic myself last year. The scenery was wonderful, the people were friendly, the prices were friendly and the beer was marvelous. I didn't see a lot of motorcycles on the streets, though, so I was surprised to learn that Prague has its own new Royal Enfield dealership. The Czech Republic is the western half of what was Czechoslovakia, after Slovakia peacefully separated. A museum in Prague details how the Czech people suffered under Communism and how they eventually won their freedom with gentle courage and determination. 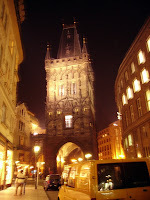 Today the Czech Republic is an exciting, fast modernizing land with an ancient history. "At the beginning I would like to say that Central Europe is very fast developing region and the motorcycle business follows the trend with about 15 per cent sales increase per year. We started the distribution of Royal Enfields here one month ago. We still cannot judge how it will work because the winter is coming. So far we have met expectations. "All of our customers so far are people about 50 years of age who already have one or two bikes and they want to have Enfield because it is something special and because it reminds them of the '60s. Enfield evokes memories of Czech Jawa motorcycles that were popular all over the world. Jawa production is almost dead today because of bad management. Enfield offers what other producers don't have: a classic, single-cylinder, four-stroke bike in retro style. "There are about 45 Enfields in the Czech Republic. Most of these people went to India and drove the whole way back on the bike. These people will probably not buy our brand new model because they made the journey to save money but they are an important base to spread the relevant information to the rest. 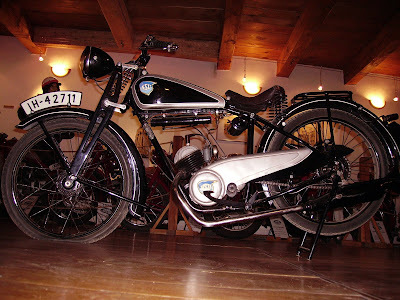 Motorcycle museum in Cesky Krumlov. Černý said Czech people will adopt well to maintaining their Enfields: "Thanks to Communist times, when almost nothing was available to buy in the market, people learned to be very clever with their hands and it is still a tradition here to work physically on something instead of hiring someone to do it. But this will slightly change with the growing level of living. "We try to be competitive with distributors in Germany, Poland and Austria. To settle the price is not easy because the Czech Republic is not on the Euro. But I think people will buy from us because of the guarantee period and other advantages. "Royal Enfield is not a very well known brand because of general lack of marketing. It is our job to change that. The 'Jawa look' will help us a lot. Not a tourist brochure: just my camera on self timer during my visit last year! Anyone can make great pictures in the Czech countryside. "Motorcycling is popular here and the country is beautiful. I can really recommend the south, with many ancient places, castles, rivers, forests. Wherever you step here you see either beautiful nature or history. One exception is the northwest part of the country, where the coal mines are. Street in Cesky Krumlov. Overhead passageway let the lord of the castle come and go without being seen by his subjects. 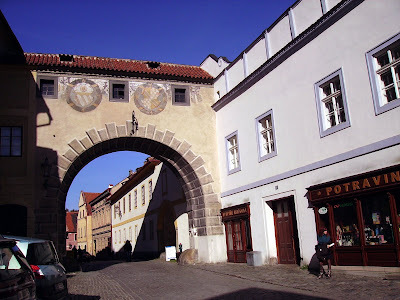 "Cesky Krumlov is an amazing (preserved) city near the southern border. 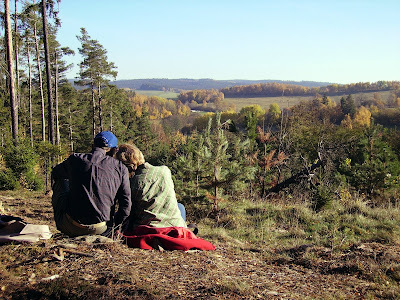 The whole triangle between Pisek, Ceske Budejovice and Susice is a beautiful place to spend a holiday." "Ceske Budejovice (Budweiss) is the place where 'the real Budweiser' is made," Černý said.